Cradle Mountain to Lake St Clair – on foot! For anyone who’s just completed a wonderful, gruelling week hiking the seventy kilometres of the Overland Track through some of Australia’s finest Wilderness terrain, the warmth and comforts of Lake St Clair Lodge are a sweet reward. After all those chilly nights in tents, on modest sleeping mats, you deserve to stretch your weary body out in a big soft bed with fluffy pillows and sleep deeply to dream of the natural wonders you’ve enjoyed on your epic journey… no longer worried about your tent blowing away. For the serious hikers who have conquered the iconic trek from Cradle Mountain to Lake St Clair, the lodge provides the perfect spot to rest, recover, and replenish, while celebrating the completion of your walk. Many walkers have told us the thought of that warm bed, a hearty hot meal, and cosy fireplace at journey’s end is what keeps them going over the last few days of their week long hike. To walk or to ferry…. 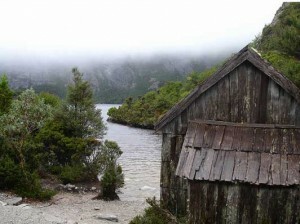 For some, the walk finishes on arrival at Narcissus Bay at the Northern tip of Lake St Clair. From here our ferry the ‘Ida Clair’ can take you down the length of the lake to Cynthia Bay, allowing you a well-earned sit down to relax and enjoy the views from the water without the load on your back. For others, the extra day’s walk from Narcissus Bay along the lake’s western shore is one more opportunity to appreciate the beauty of the lake and surrounds, arriving at Cynthia Bay on foot to the very end of the track. Whichever route you take, you’ll be ready for a solid meal and some luxury comfort which we are only too happy to provide. To find out more about the ferry service or to book the ferry click here. 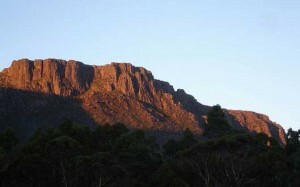 The Overland Track is renowned throughout Australia and the wider hiking world as one of the great wilderness bushwalks. Its an epic , multi day trek across more than 65 kilometres of magnificent World Heritage Wilderness. While normally completed within five or six days, the options of side-trails encompassing further attractions like cascading waterfalls, and peaks such as Mt Ossa, many walkers allow eight to ten days to fully explore and appreciate the rich array of natural wonders. FAST FACT: ‘Race Hikers’ carrying little more than drinks and energy snacks have completed the full Overland track in under eight hours..but at that pace we doubt they fully appreciated the views or the wilderness as most hikers would! 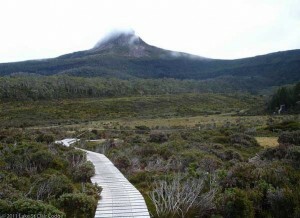 The track lies between Cradle mountain in the north and Lake St clair in the south, and is most commonly traversed form North to South. Being a wilderness area, there are no amenities or facilities along the route so hikers need to carry all their own food and cooking provisions for the duration of the hike, and of course carry out all their rubbish to leave the wilderness area unspoilt. A handful of alpine huts along the route provide shelter for a few walkers, though most will spend each night sleeping in their tent , and ideally a very warm sleeping bag. For our many visitors who aren’t quite ready to tackle the full Overland Track, you can get a taste for this adventure with a range of walks around the Cynthia Bay area ranging in length from from 20 minutes to several hours. If you’re really keen and suitably prepared you can take the ferry from Cynthia Bay to Narcissus Bay at the top of the lake and walk about 17 km back to your comfortable accommodation . Its the track’s final optional leg that some of the ‘Overlanders’ take, but this way you can experience a taste of the great Track without having to carry a week’s worth of food, clothing, camping and cooking equipment! Visit the Parks and Wildlife service for more information about the Overland Track, including Booking requirements and Track fees.